The Manager’s Handbook is a repository of advice and information on how to carry out either the District Manager or Region Manager role. It is also helpful for those in Assistant Management roles or those undertaking Region or State appointments. The content has been designed to act as a “how-to” guide for new Managers, as well as being a useful ongoing resource. Being Involved with Guide Units. The Manager’s Handbook contains most of the reading required to gain either the Region Management or District Management Qualification. The Manager’s Handbook is a source of advice and so it does NOT contain complete information on policies and procedures. 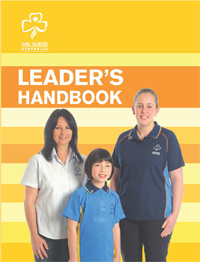 Guide Lines sets out all the current policies of Girl Guides Australia and is available on the GGA website. In addition to Guide Lines, some States and Territories also have administration manuals. These manuals contain the specific policies, procedures and forms for each State as well as State specific information on organisation structures, key appointees and resources. These manuals can be found on State websites together with relevant policy and procedural information. Guide Handbook 5 – 14 to 17 years. You should also obtain a copy of the Leader’s Handbook which contains comprehensive information on both the Australian Guide Program and the role and responsibilities of Unit Leaders.